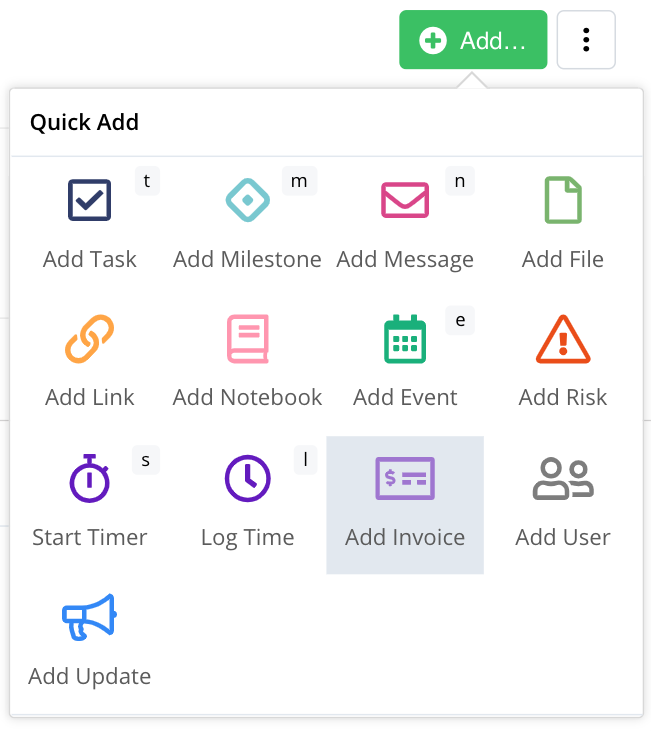 Within Teamwork Projects, you can create invoices in your project based on either time logs and expenses, or with a fixed price. To create a new invoice, go to the Billing area of your project. From there, select + Add Invoice to the upper right. In the add invoice modal, you will need to fill out the required fields in the Essentials tab. You can use the Optional tab to add other details such as notes. Invoice No./ID: Enter the invoice ID or number of the invoice. There are no restrictions on the types of characters added here. Issue date: The date you wish the invoice to be issued on. Currency: We support all major currencies. 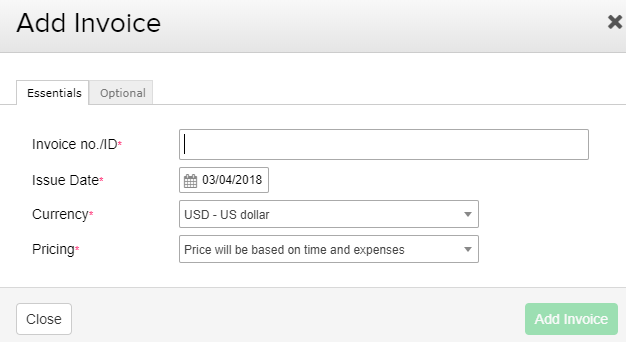 The currency selected will display on the invoice in a number of areas, this includes the total, the subtotal and inline with the time entry or expense. Invoice pricing: Choose whether your invoice is to be a fixed price or based on the time and expenses added. PO number: Choose to enter a client purchase order, if required. Notes: Add any notes you may require to show on the invoice. The notes will display in the upper section of your invoice under the issue date. Filtering options are also available for both unbilled time log lists & expenses. This allows users to choose & find time logs or expenses associated with a person or date range along with how logs are sorted - ascending or descending. If you chose the fixed price option when creating the invoice, the invoice total will be the figure you set, regardless of the time and expenses you add. If you chose the other option, the total will be calculated taking hourly rates for each person into account. Note: When you have added a time log to an invoice, it will show up as billed and the time log won't be editable. You can also add invoices via the Add... option in the project's Overview section.